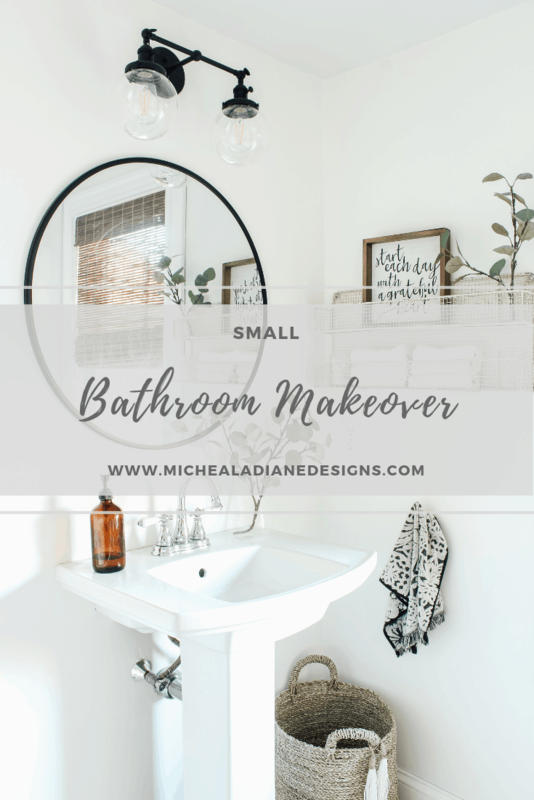 Today I am sharing our small budget friendly bathroom makeover. This bathroom was never really on the project list. 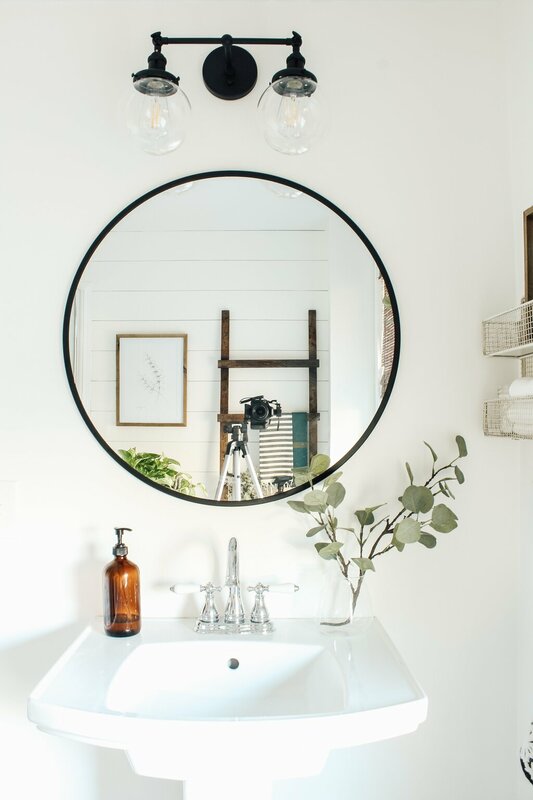 One day I woke up and said, “I want to redo the bathroom” and once I had decided I couldn’t stop thinking about it. Luckily I have a really supportive husband and he is usually on board with all my crazy design plans. It did not need a huge overhaul and had actually been recently redone by the previous owners. It just wasn’t my style. So we put together a budget and a design board and ran with it. Excuse the iPhone pictures and to make it worse I forgot to take photos before we started putting up the shiplap. In any case here is the before, it was not that bad just a little too basic builder for my style. With a little paint, new fixtures and some designer touches it became a whole new space. Paint: You guys, paint is the cheapest way to update any space for some seriously big impact. I am obsessed with the color white but finding the perfect one can be difficult. I always recommend to my clients to paint samples in a couple of different places within the space. It is best to look at them in different lights, natural and artificial, and different times of the day. We did this and ultimately decided on Benjamin Moore Simply White and I love it! 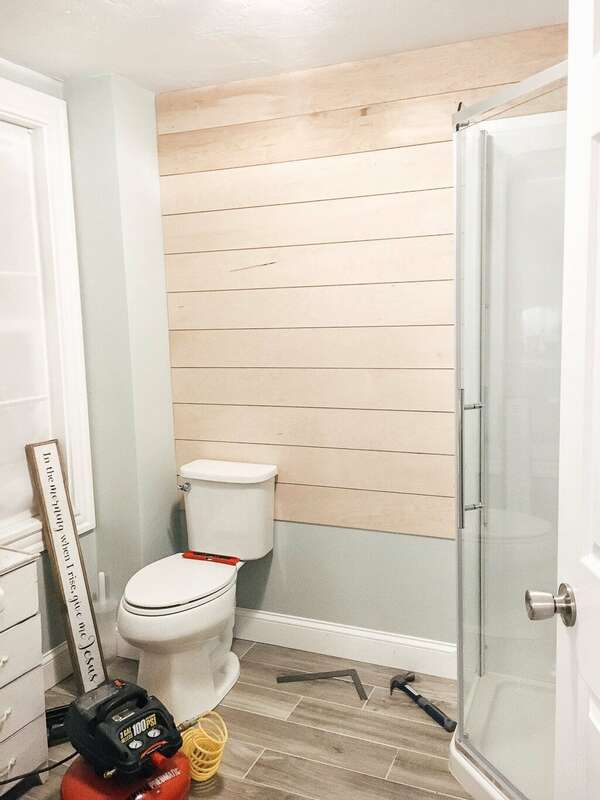 Shiplap: I really wanted some type of feature wall, because this is the wall you see right when you walk into the bathroom. It is also on the first floor off of our kitchen. One way to do a feature wall is to add color, but I really wanted to keep the space white. So instead I went with texture. This was a simple inexpensive DIY that added major impact and interest. I will be doing a full post on how you can add it to your own home soon. 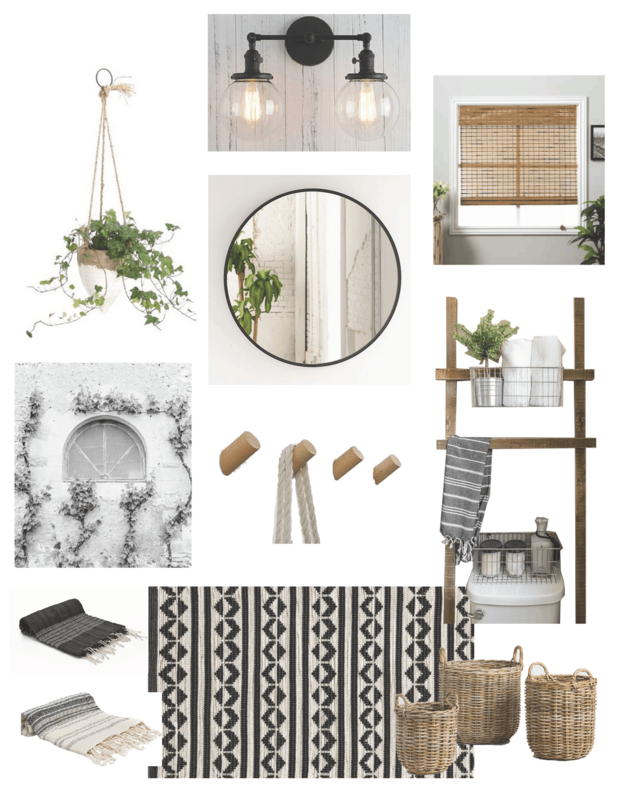 Window Treatment: I wanted to add a warm and natural wood element. This bamboo shade was the perfect way to bring in all of those elements and provide privacy since this is a first-floor bathroom off of our back deck. Lighting: The next element I wanted to add to the bathroom makeover, was black details. I love the contrast that it adds to a room. This light fixture has been on my wishlist for a long time, and I was so happy that I found the perfect spot for it. The style is a little industrial and a little modern. But it also has that vintage vibe with the Edison light bulbs. 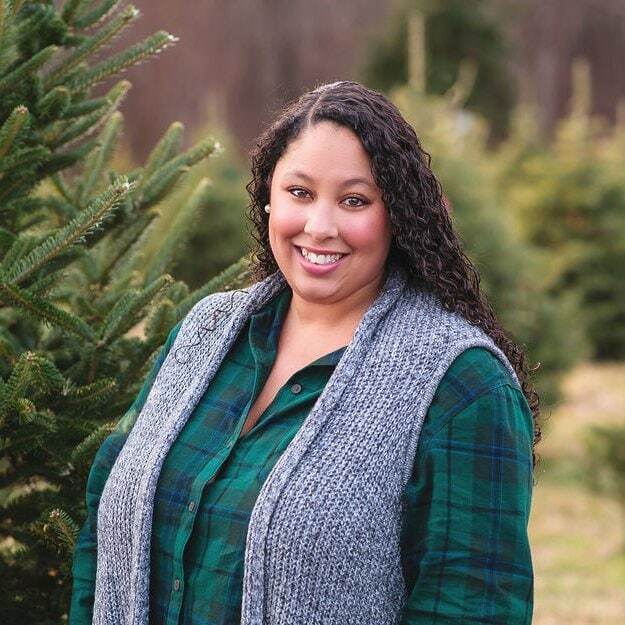 I am also pretty sure Joanna Gaines used a similar one in a fixer-upper episode, so that alone makes it a win! Mirror: A new mirror was a must and I fell in love with this one from Target. A round style is a perfect option for over a pedestal style sink. I also loved that it had a black frame. It goes perfectly with the light fixture. 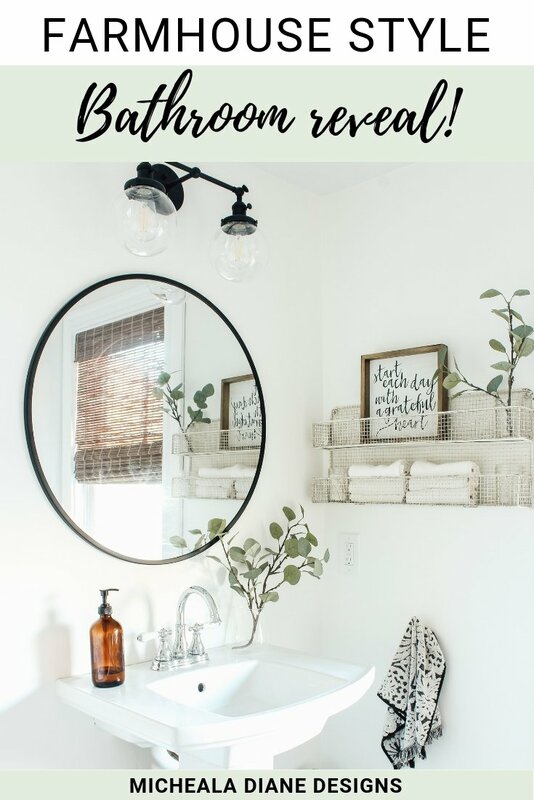 Decorative Details and Storage: After deciding on all the major bathroom elements I added some final touches. 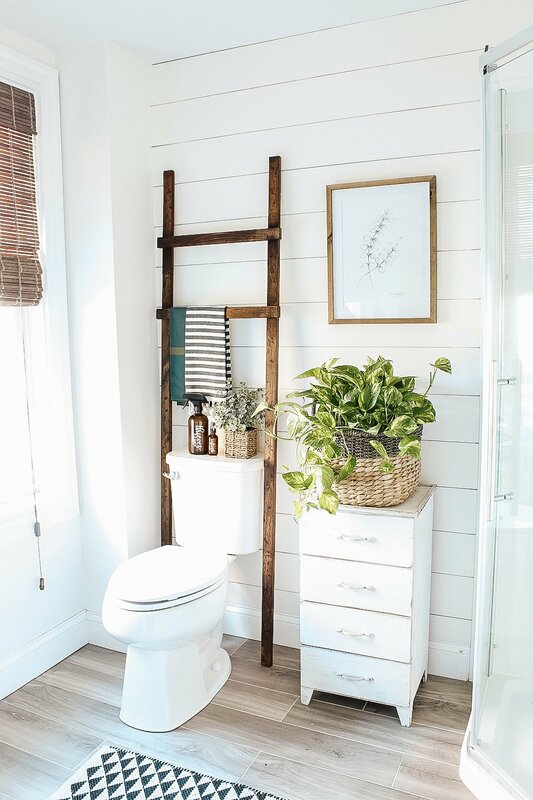 My inspiration for this bathroom was whites, blacks, wood, and greens. For the accessories, I went with plants, artwork, black, and white hand towel and a pretty amber soap dispenser. 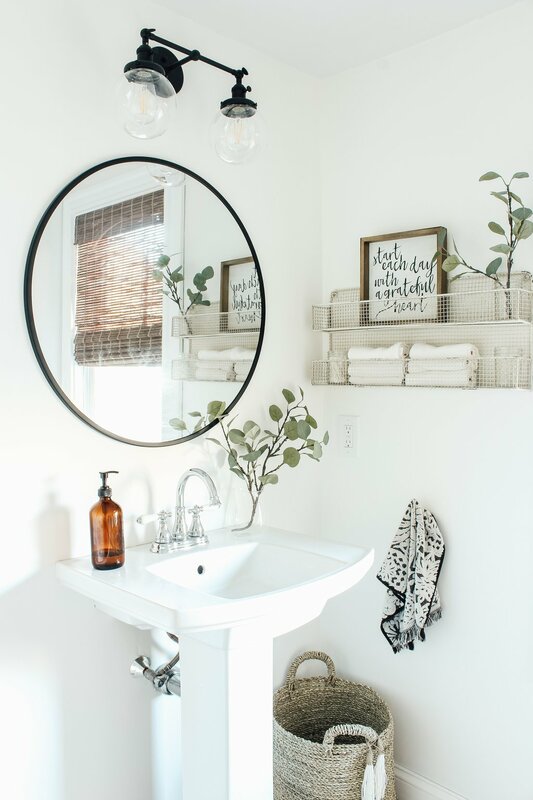 Adding a storage element was key because this bathroom does not have any storage at all. This can be a con of having a pedestal sink. To fix this I added a small vintage side table with drawers. I found this at a local antique show and knew it would be a perfect fit. I also added a jute basket to hold toilet paper and a small trash can. Another DIY we did for this project was a bathroom ladder to go over the toilet. This added visual interest as well as hand towel storage. You can see how we made it in this post. We are so happy with this makeover and its proof that small changes can make a big impact. Thanks for stopping by! Want to save this for later? 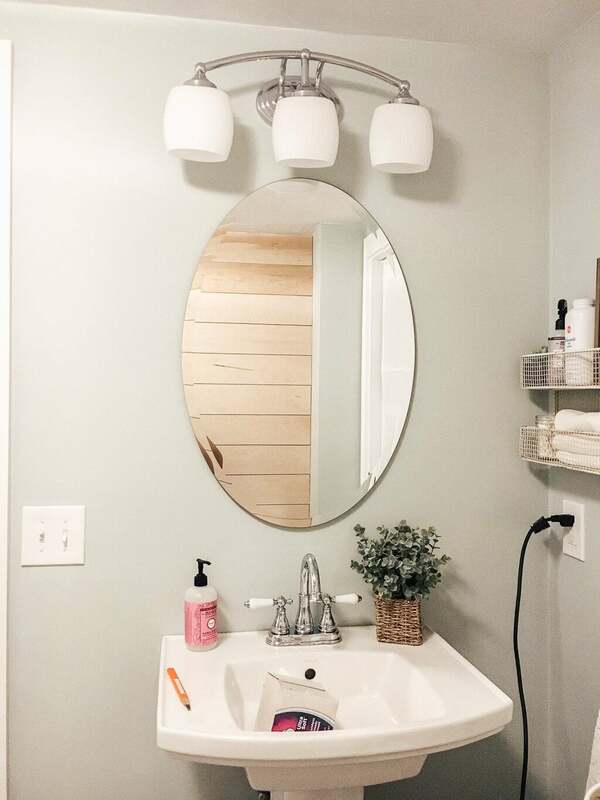 Post this Small Bathroom Makeover to your favorite Pinterest Board! You are so sweet Alex! Thank You! Hi Micheala! We just moved back home to Georgia from Vermont. I miss it so much! So, you’ll just have to enjoy being up north for the both of us! Anyway, you clearly have God-given talent girl! 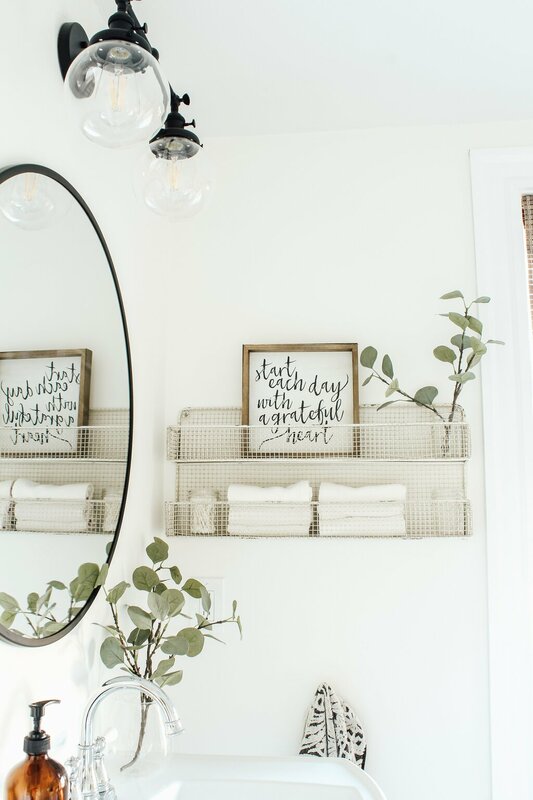 I especially love the way that you add tons of character to a space without a total gut job…it’s so nice to see such beautiful spaces on a budget. We just bought a home and we’re going to be painting. I really wanted to go white but felt a little insecure about it. Your home gave me the confidence to go for it! Thanks!